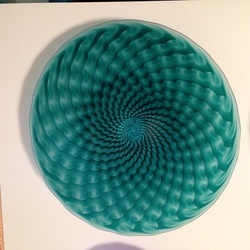 Spun out with heat and centrifugal force these round wall sculptures are delightful and exciting. With minimal hardware you can transform a normal wall into a stunning display of color and form. These ornamental plates are intented to be hung from a simple picture hanger. Early windows were filled with these "roundels", or "bullseyes" spun out in a similar manner. Each style has a different application of color. Spiral Galaxy, Marbled, Equinox, are just three of many color formats. Some are twisted or pulled or pressed, depending on your taste. Why not get one of each? 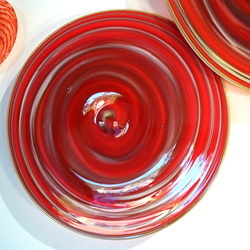 These plates start as a simple inner spiral of one color (made with a half/half twist, or an optic twist). Then we add an opaque background and perhaps a lip wrap. Essential for giving your wall plate installation the impression of the cosmos above and below. 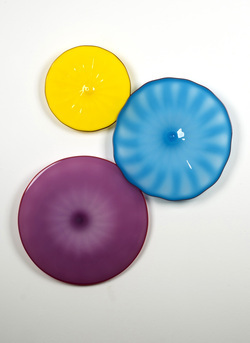 These plates are a base of opaque color and accented with two other colors of frit. Twisting the color up and kneading it makes a marbled background with plenty of color texture. Imitating polished countertops you wish you had. These give an organic feel to your wall grouping. A double optic pattern (one clockwise, another counter clockwise) gives a scintillating effect. 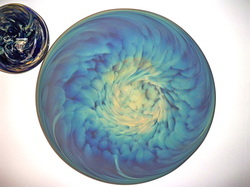 First created for our Equinox show which included a number of painted and glass mandalas. These are generally transluscent and etched on the back side to provide a satin finish.